Posted by intellectualgridiron in Science. Usually when you think of the word “boilerplate”, you might think of some sort of insincere, hackneyed statement from a public relations person or a politician. But when it comes to the history of space exploration, the term takes on a much more important meaning. Boilerplate spacecraft are simulations of the real spacecraft, having the size and shape of the real thing on the outside, but are not actual flight articles. Their use is for simulation and testing without putting an actual, flight-ready spacecraft at risk to damage, etc. The video above offers a more thorough explanation with some excellent examples of how such mock-ups were utilized. I have had the privilege of encountering lots of genuine NASA spacecraft over the years, but I’ve encountered a few interesting “boilerplates” as well. Indeed, by interest in space was kindled by frequent encounters with a boilerplate. As a Louisville, Ky., native who lived the first 6 and a half years of his life in that city, my parents often took us to what is today called the Kentucky Science Center (back then it was the Louisville Museum of Natural History and Science). From about 1980 (the year I was born) to about 1996, they had an impressive space gallery on the first floor, with all sorts of cool space artifacts. I can still see them all as a kid, walking along and viewing the amazing vestiges of “vintage space”. There was a test pilot’s helmet from the 1950s; various astronaut gloves, an astronaut suit (whose specifically I cannot recall); a 1:4 scale model of an Apollo Lunar Module; an old Gemini simulator that you could actually sit down inside; part of an old rocket engine; 1960s-era NASA mainframe computer panels (no joke – these made up a mini-corridor all their own); a scaled down model of an Apollo Command Module, pre-launch, hence its white exterior (about 1:8 scale, give or take). But the obvious crown jewel of the exhibit was Apollo BP-1102A, a water egress-training module. After Apollo 13’s “successful failure,” NASA removed the interior of that used spacecraft and moved it into this particular boilerplate for investigation purposes. The shell of the Command Module Odyssey was eventually put on display at the Air and Space Museum in Paris (yes, France), while Odyssey’s interior and newly wed BP-1102A somehow found their way to the museum in Louisville. In that same room, there was a photo of all three astronauts from that mission on hand for an exhibit inauguration ceremony in front of the museum’s façade along Main Street in downtown. Since this was around the time I was born, it was a fortunate thing that all three astronauts — Jim Lovell, Jack Swigert, and Fred Haise — were able to be together again, as Swigert died of cancer roughly two years later, ironically just after getting elected to Congress. As a very young boy, I did not know about “Boilerplates”: all I understood was that the Apollo 13 was in my hometown. As I got older, it gradually dawned on me that the authentic part of the display was the capsule’s interior, while the exterior shell was a mock-up. The copper-colored paint job was to make the boilerplate look like the Block II Apollo Command Modules during splashdown, after they burned to a golden-brown color during re-entry on account of the massive fraction of Earth’s atmosphere. As a Louisville native who visited the Kentucky Science Center as often as I could growing up, encountering this distinctive Apollo boilerplate at the Udvar-Hazy Center was like seeing an old friend. (C) photo by the author; Nov., 2014. But all good things come to an end, sooner or later. By the latter half of the 1990s, the whole spacecraft was gone. The popular 1995 film Apollo 13 with Tom Hanks, Kevin Bacon, and the late Bill Paxton had apparently made the local spacecraft landmark too valuable a commodity to be tucked away in Louisville. What I heard at the time was they reunited the interior with the exterior shell, but the “restored” spacecraft’s whereabouts were unclear to me, until I later found it that it was on new display at the increasingly famous Cosmosphere in Hutchinson, Ks. (Of all bloody places!) Moreover, the space hall was moved up to the second floor of the museum, and by that time, it was already a shell of its former self. Presently, the whole exhibit has been phased out, sadly, but the Gemini simulator is still on display there, thankfully, ever inviting guests to sit down inside and experience a hint of “vintage space” for themselves. But one thing I did wonder for the longest time was, whatever happened to BP-1102A? Only in recent years did I learn of NASA spacecraft boilerplates, and that is when I “put two and two together” and realized that I had many a hands-on encounter with such a test model while growing up and did not even realize it at the time. Convinced I would never see it again, I was eventually proven mistaken. A past job fortuitously took me out to the East Coast for a month in November of 2014. While there, I seized the opportunity to visit the Udvar-Hazy Center (a remote annex to the Smithsonian Air & Space Museum) near Dulles International Airport. While there, I came upon a boilerplate that looked eerily similar to the one I always ran to the old space hall in Louisville as a young boy. Further research afterwards indicated that I had indeed seen an old “friend” for the first time in almost 20 years. In addition to being given a much more prominent venue for display (it does not get any bigger or higher-profile than the Smithsonian), it has also been fitted with the flotation collar and balloons from the Apollo 11 – talk about an upgrade! Not too long after this reunion of sorts, I came across another Apollo boilerplate (29A), this time at the immense Meteor Crater near Winslow, Ariz. Obviously, it is but a small side-show to the main attraction, but it is intriguing to encounter nonetheless. Much like BP 1102A, the purpose of Boilerplate 29A was to test the systems that helped the Apollo capsules stay afloat during splashdown in the ocean. Another Apollo Boilerplate (29A) that I encountered while visiting the massive Meteor Crater near Winslow, Ariz. (C) photo by author; May, 2015. The lesson of this story – such as there is one at all – is to keep your eyes peeled for these interesting space artifacts during your sojourns, as you never know when you might encounter them. After all, as the video at the top of the article reminds us, they have their own special place in the history of space travel and the development thereof. Paleontologists announced a major discovery in Paris recently, that of a new species of apex Theropod predator found in North America. At over 30 feet long and weighing 4 tons, It was one of the greatest land predators on Earth when it lived 100 million years ago. Scientists found the fossilized remains sticking out from a slope in the Cedar Mountain Formation of Utah in 2008. It would take two years to slowly remove them from the rocks and cleaned, and two more to analyze the bones to see if in fact this were a new species not yet in the scientific/fossil record, etc. Scientists named it Siats meekerorum; the genus honors the mythical, cannibalistic monster from Ute tribal lore (the genus name is pronounced “SEE-atch”). 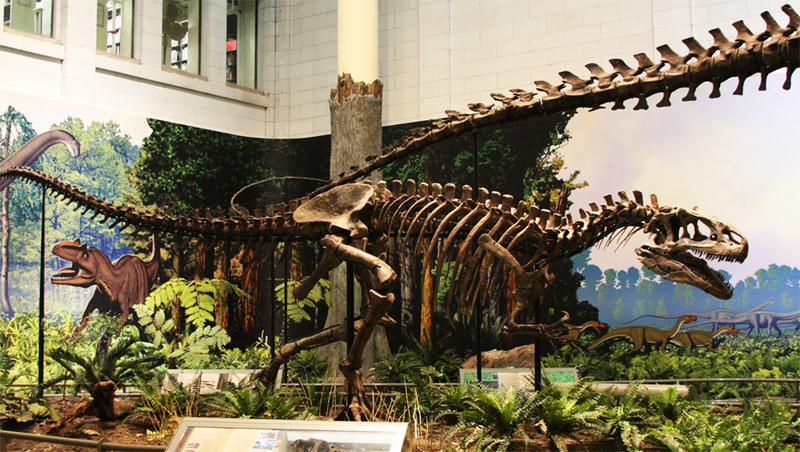 The fact that a new 30-foot Theropod has been discovered is amazing news enough. But what is even more amazing is that this is the first predatory dino species this size to be discovered in North America in more than six decades. “It’s been 63 years since a predator of this size has been named from North America,” said Lindsay Zanno, of North Carolina’s State University and Museum of Natural Sciences, in a press release. “This dinosaur was a colossal predator, second only to the great T. rex and perhaps Acrocanthosaurus in the North American fossil record,” Zanno continued. Even more significant is that the discovery of a predatory species this size fills in a 30 million-year gap between the extinction of Allosaurs and the maturation of the evolution of the Tyrannosaurs in North America. True, Carcharodontosaurus was a major predator at this time, too, but the current fossil record indicates it was only around from 100-93 million years ago — much more narrow span of time. Moreover, its fossils have been found in what used to be the supercontinent Gondwana (specifically, present-day Africa and South America). The aforementioned Acrocathosaurus was in the same taxonomical family as C. saharicus, and it was found in North America, but its known span of existence, according to current fossil records, was about 116-110 million years ago. The discovery of this species has shed new light as to which species sat atop of the proverbial pyramid in this given ecosystem in North America some 98 million years ago. The Tyrannosaurids that did exist at this time were much smaller. The extinction of Acrocanthosaurus first, and later Siats meekororum dying out, eventually opened up the opportunity for Tyrannosaurids to grow larger into the T-rex that we all know and love today. Another new species of dinosaur has been discovered, this time a Ceratopsid (a term that means “horn face” in Greek). What is particularly striking about this newly discovered species is twofold. One, it was an usually large nose in a suborder/family (Ceratopsia / Ceratopsidae) whose species have large beaks that define their facial features. Two, the horns. The shape and direction bear a strong resemblance to those of, well, a Texas Longhorn (the type of cattle, not a football player!). The name of this newly-discovered species is Nasutoceratops titusi, which in Greek/Latin roughly translates into “Titus’ Big-nosed Horn Face”. The ‘titusi’ species designation seems to be an attempt at the genitive case of the name “Titus”, but ‘titusi’ sounds much better than the grammatically-accurate ‘titi’. Indeed, the species name was fashioned in honor of Alan Titus, a paleontologist at the Grand Staircase-Escalante National Monument in southern Utah*, which encompasses the area where the fossils were found. Latin grammar aside, the name is quite fitting. Usually, the first thing that draws the attention of the eye to most Ceratopsid species are the horns, but in this case, it’s a draw. The horns are slightly smaller when compared to, say, Triceratops or Pentaceratops, but the nose is quite prominent, almost identical to that of a Macaw parrot in shape, though obviously much larger than the comparative bird. The obvious use for horns was self-defense, but also, in the case of this species (if not for others, too) was to lock them with those of other males for dominance in a herd. For years, it was postulated the the distinct frills behind the face and horns were a means of neck protection, but in recent years, that long-held idea has been subject to dispute. As one can see in the “plan view” of the skull, there are two large ‘fenestrae’ (openings in a skull behind the eyeball socket) in the bone frill, which begs the question: if the bone frill were a means of protecting the neck from predators, why have large holes in it? Given that these ‘holes’ are thought to be fenestrae (‘windows’ in Latin), perhaps it might be for muscle attachments for strong jaws instead. At least, that is an alternate idea. The point of exploring these ideas is very germane towards the discovery of this species. 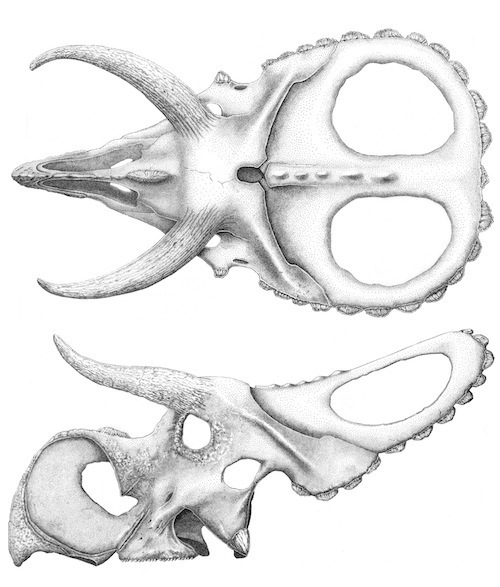 For example, the relatively smaller horns might suggest that there two distinct sets of Ceratopsids, as an interviewed paleontologist suggested in a National Geographic article. Moreover, Nasutoceratops’ discovery was announced in a study co-authored by Scott Sampson, a paleontologist at the Denver Museum of Nature and Science. He put the significance of this find very succinctly: “[T]his find raises some great questions and mysteries. We’re just beginning to understand the world of dinosaurs.” Such is a very telling acknowledgement, given that we have been studying dinosaurs for about 190 years. *Utah is a long-time hotbed for both Jurassic dinosaur fossils as well as Cretaceous ones, including the species that is the subject of this article. Along with its neighboring states (Colorado, Wyoming, Arizona, New Mexico, and states over such as Montana and the Dakotas), the whole badland interior of the western States has yielded new dinosaur discoveries since the 1870s, and continues to yield a wealth of new finds to this day. Posted by intellectualgridiron in Science, Sports. 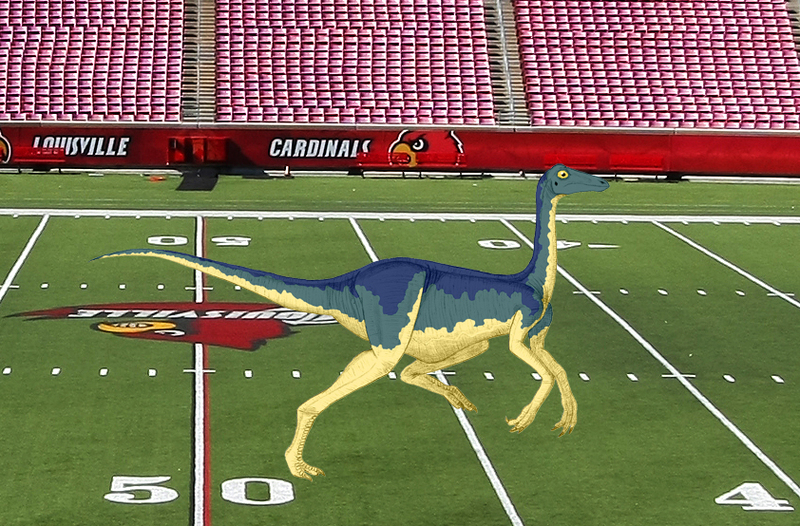 Ornithomimus/Dromiceiomimus (depending on your nomenclatural school of thought) would make an ideal wide receiver within the world of dinos, according to a paleontologist. Photo and drawing by author. Holy cow is this awesome! Spencer Hall of Every Day Should Be Saturday interviewed a vertebrate paleontologist who gave him the break-down on what dinosaur species would be the best football players at different positions. In yet another cool instance of where science meets sports, it doesn’t get much better than this! The only flaw I could discern in the blog article is with one of the photo montages. The scientist explicitly said that T-rex would make the best middle linebacker (and I concur! ), but they superimposed a Raptor head from Jurassic Park on Ray Lewis instead of that of a Tyrannosaurus head like they should have. 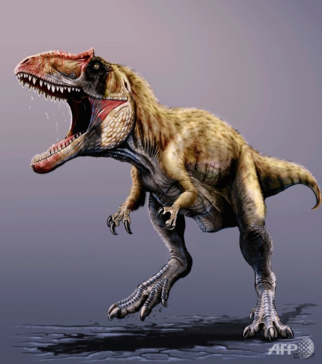 True, both were carnivorous Theropods, but T-rex was much larger, robust species, whereas the Raptors, like the other Dromaeosaurids, were smaller and more nimble, thought arguably pound-for-pound, even more ferocious than the King Tyrant Lizard (whose head they stuck on Brett Favre instead!). Spoiler alert: in the article, Dromaeosaurids are, not surprisingly, given a place on the roster, too! Posted by intellectualgridiron in Pop Culture, Science. As a life-long Paleontology enthusiast, I feel compelled to give General Motors lots of credit for this creative commercial. Remember that comic book and cartoon series “Cadillacs and Dinosaurs”? Well, feast your eyes on the next-best thing: Buicks and dinosaurs! What caught my eye the first time I saw this commercial was not just the dinosaurs, but their species and size. Yeah, they were big – really big, but just how big? It obviously varies from genus/species to genus/species, but what interested yours truly was their depicted size in the commercial. We science/engineering geeks are sticklers for accuracy, after all! Start with the beginning. The Stegosaurs parked next to the fire hydrant are accurate. Stegosaurus armatus, for example, reached about 30 feet in maximum length, meaning that its likeness regarding shape and size in the commercial is well portrayed (S. stenops was not quite as long at 23 feet in max. length). So far, so good! At seconds 6 through 13, we feast our eyes on a massive Sauropod, massive even by the standards of the already-large species found within the infraorder. My first guess was this was an outsized specimen of Apatosaurus (known by many as “Brontosaurus,”) which was indeed large at an average length of 75 feet. But as big as it was, it is doubtful that its feet were almost as wide as the car itself, even if the Buick Encore is relatively small. 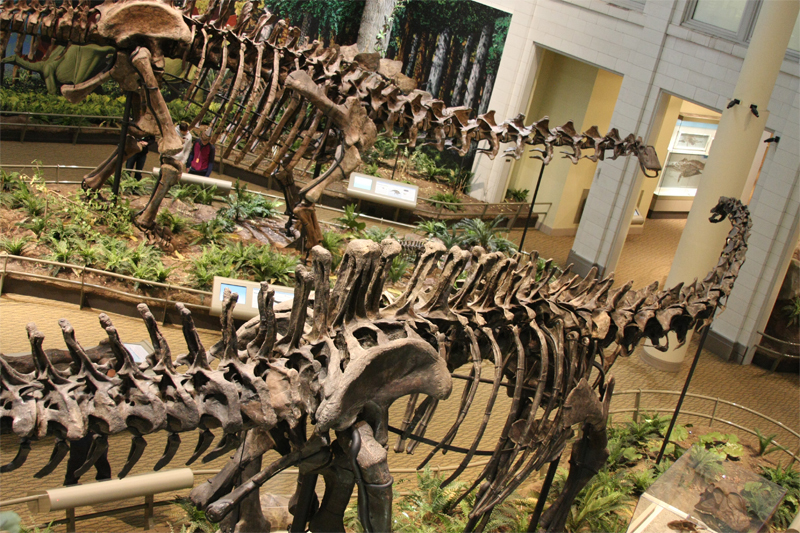 The photo below of a Apatosaur skeleton right next to a Diplodocus skeleton might give the reader a better reference of its average size, as one can see a couple of people standing behind it. Apatosaurus in the near background, and Diplodocus in the foreground at the Carnegie Museum of Natural History in Pittsburgh; photo by author, Dec., 2010. My guess regarding the large Sauropod depicted in the commercial in question is either an outsized specimen of Apatosaur (it was the overall shape of one, if not oversized), or, more plausibly, an Argentinosaurus, one of the largest dino species currently known to man. This compilation of photos I snapped at the Fernbank Museum in Atlanta back in early 2009 should back up the validity of this educated guess. The man ascending the staircase gives the reader an idea of its huge size. Argentinosaurus reconstructed as being pursued by a Giganotosaurus, a Carnosaur/Theropod even longer than T-rex! Photo by author, Fernbank Museum, Atlanta, Mar. 1, 2009. Next up at seconds 14 through 16, the couple in the Encore are passing up a couple of Ceratopsians. The initial impulse is to say “Triceratops,” which is entirely understood, given that he was the biggest and most famous of that suborder. But the frills of these two fellows are way too squared for that to be Triceratops, so my educated guess is that these are slightly outsized Chasmosaurs, who also had three horns like their slightly larger cousin (most Ceratopsians just had one, on the nose), even though theirs were not as long as the larger species. Meanwhile (“…back in the jungle!”), as the camera gives us the vantage point of seeing through the windshield from the backseat, we see more Stegosaurs and Sauropods moving along the boulevard during seconds 17 through 19, and then the car has to maneuver around another large Sauropod (possibly a slightly-outsized Apatosaur, if not another Argentinosaur), before eventually pulling into a hotel entrance next to another Stegosaur to cap off the commercial. Here the Stegosaurs is depicted a bit larger than its maximum size, unless the roof in front of the hotel desk had a very low clearance of 13 feet or less, as that was S. armatus’ maximum height, plates included. The Stego tail and spikes in the background during seconds 27 through 29, however, are sadly way oversized. The spikes in question would reach about three feet at the most. Something else that gave cause for notice is that all the dino species depicted in this GM commercial are plant eaters. So what, right? The significance of this selection of species was that these are thought by many – though by no means all – scientists to be cold-blooded, or at least homoethermic, whereby they were big enough to maintain their own temperatures. But put these two things together, and these species would be, on average, on the slower scale of dino agility, particularly when compared to their potentially hot-blooded Theropod predators. * What it boils down to is a “big-and-slow” versus “small-and-nimble” comparison that GM implicitly makes in this advertisement. One must analyze these sizes with the perspective that these are all computer-generated, and as such, when superimposed into a real-world setting, it’s difficult to get the relative size proportions correct, especially when these objects are in constant motions and audience viewing angles are constantly shifting. Still, while most shown sizes are a tad exaggerated, some were dead-on, and overall, the effort is quite laudable, as the commercial certainly piqued my interest, and hopefully those of millions of other viewers! *The cold-blooded/warm-blooded dinosaur debate has been brought up before in a previous article and shall surely be revisited again. Another scientific paper offers convincing evidence that (at least some) dinosaurs were warm-blooded, such as this Allosaurs, but what of the Apatosaurus whose tail is also visible in this picture? Photo by the author, taken at the Carnegie Museum of Natural History in Pittsburgh. But believe it or not, there has been a four-decade debate as to whether or not dinosaurs were ectothermic (i.e., cold-blooded) like all reptiles today, or endothermic (i.e., warm-blooded) like birds and mammals. It was not always that way; even most of the earliest dinosaur fossils discovered roughly 190 years ago gave scientists clues that the dinosaurs were indeed reptiles. Once complete skulls were discovered in the subsequent decades — particularly the 1840s onward — it because quite clear that not only were they reptiles, but they were diapsids like most reptiles today, save for turtles and tortoises, which are anapsids. The explanation to differentiate those anatomically cladistic terms is for a different article at a different time. Given that the earliest evidence was that dinos were indeed reptiles, people therefore accepted it as a given that they were ectotherms. After all, every species of reptile today is cold-blooded, why therefore not the dinosaurs from roughly 225 to 65 million years ago? All that thinking changed with John Ostrom‘s discovery of Deinonychus in Montana in 1964. All of a sudden, the bird-like characteristics of some of the feet and parts of the skeleton caused scientists to totally re-think dino metabolism, and eventually kicked off the great debate of warm-blooded — if not outright hot-blooded — vs. cold-blooded schools of thought. The paper referenced in the linked article announcing its publication will, in all likelihood, not settle the debate, and for a valid reason. It is easy to see the Carnosaurs, or meat-eaters, to be warm-blooded, as well as the less-vicious but very-much bipedal Coelurosaurs, what with their bird-like characteristics — albeit to varying extents — but what about the plant-eaters? If, say, the Sauropods were warm-blooded, can one imagine how much energy it would require — in other words, how much plant matter they would have to eat — in order to sustain themselves? It remains an intriguing question. This time around, in the latest study, published in the scientific journal Nature, the scientists cite the bone growth rates of dinosaurs, and how they match up to all sorts of different species of modern mammals. In the abstract, it affirms what has stood to reason within part of the paleontological community for roughly forty years. What is left out in the piece, though, is what specific dino species’ bones were examined, and whether or not plant-eaters’ bones were part of this microscopic examination. If they can demonstrate that, say, Sauropods had similar bone growth patterns as the established warm-blooded Theropods, then it shall open up the floodgates for all sorts of speculation about the sustenance behaviors of the vegetarian dinos, if nothing else! Let the fascinating discoveries continue! Although this photo was taken by the Voyager 1 probe over 30 years ago, it still remains one of the most iconic images of Saturn in the minds of many people on Earth today. As the year 2012 comes to a close, it is worth remembering that out in the distant cosmos, the Voyager probes continue to speed along, blazing new trails in so doing. It has been 35 years and counting since they were launched to photograph and analyze the gas giant planets in our solar system in unprecedented detail. Once those primary objectives were completed, the next stage was to explore the outer reaches of our solar system, and then leave it completely to star systems beyond. All the while, they have left us some indelible images. Voyager 1 first flew by Jupiter in 1979, not only taking better pictures of our system’s largest planet than ever before, but making key discoveries along the way. Not only did it find some new satellites, but its discovery of volcanic activity on the Gallilean moon Io was a find that led us to totally rethink the possibilities of different kinds of geological activity throughout our neighboring planets. When Voyager 1 flew by Saturn a little over a year later, it gave us many new, detailed photos of Saturn, one of which still remains one of the most iconic images of that distant, large, ringed planets, despite Cassini’s more detailed photos that started to reach us about eight years ago. So while Voyager 1’s primary mission was completed over three decades ago, it was just warming up compared to its second major set of objectives. Three and and half decades onward, some scientists at NASA’s Jet Propulsion Laboratory in Pasadena, Calif., continue to monitor the probe’s progress, and recently, it has started to make headlines in the scientific community yet again. Oh, it has a list of decent achievements since 1981, to be sure, yet its recent discovery has really made headlines! Back when I was in the fourth grade, I remember seeing in my Weekly Reader how scientists hoped that the Voyager probes (specifically Voyager 2, but the same goes for ol’ No. 1) would reach the end of the solar system by 2015. At that point, I was thinking “2015? Pluto’s not that much further beyond Neptune, is it?”* Well, it turns out there is a lot in our Heliosphere beyond the planets that we know of. Speaking of which, how many of us knew what the Kuiper Belt was before the Voyager probes boldly went through where no man-made probe had gone before? Now, Voyager 1 has boldly gone further still. Earlier this month, the scientific community was abuzz about the probe getting its first-ever taste of interstellar space (and ours, too, albeit vicariously!). Ed Stone, a project scientist who continues to monitor Voyager 1 at JPL, has pointed out that while getting closer and closer to actual interstellar space, the probe has discovered something totally new: a “magnetic superhighway!” Yes, this is what the scientists are currently describing this outer edge of the Heliosphere (basically, the part of space that the Sun has any influence over regarding gravitational pull, magnetic/radiation direction, etc.). One naturally is inclined to ask, how has the probe lasted so long? Would it not have gone dead long ago? Would its, er, battery not have died out? Well, Ed Stone points out that the nuclear fuel used to power the craft has an 88-year half-life. That would be plenty of time to leave the Heliosphere and relay data of what it is like to truly be in interstellar space. So, as its mission surpasses 35 years and counting, Voyager 1 continues to boldly go to send us data on its new discoveries and exploratory firsts. Any of us interested in studying space shall wait in the coming months and couple of years to see what other firsts the probe will achieve. Happy New Year! Oh, and just think; in 2015, the New Horizons probe is expected to reach Pluto, and give us unprecedented photos and info from that part of the Solar System! *The occasion of the Voyager 2 probe being given the main story in my Weekly Reader during my fourth grade year in the early Fall of 1989 was that it just passed up the planet Neptune; a new exploratory achievement for any man-made probe! No doubt everyone can breathe a sigh of relief after reading those last two words of the headline. But it is true, sort of. An asteroid that is a quarter of a mile long — bigger than even America’s largest aircraft carrier, is headed towards the near-vicinity of Earth. Officially named YU55, its current trajectory has it flying by the third rock from the Sun on Nov. 8 at a distance of only 202,ooo miles — closer than the Moon (at only 240,000 miles away). 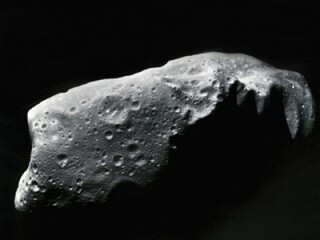 Scientists have been studying this asteroid long enough to be as certain as humanly possible that it will not hit Earth. If it did — Heaven forbid — though, the result would be a possible oceanic impact, with 70-foot tsunami waves 60 miles away, and causing a 7.0 earthquake that that part of the world. So says asteroid impact expert Jay Melosh of Purdue University, my alma mater. This scenario pales in comparison to the fictional scenario from Armageddon, where that fictional asteroid was the size of Texas, and should it have crashed into the Pacific Ocean, would have caused a tidal wave to wash up to Denver, and enough dust to cloud out the Sun for an epoch. But as Melosh points out, impacts of the relative proportion of the very real YU55 happen about every 100,000 years. The comforting, silver lining in that otherwise rather disturbing thought is that such impacts are survivable, provided that you’re not within, say, 75 to 100 miles of said impact. In the meantime, though, this close encounter with the asteroid kind gives scientists and lay astronomers alike the golden opportunity to see a huge chunk of extraterrestrial rock up close and personally. Sites for astronomy enthusiasts have been mapping where in the sky YU55 is expected to pass through. But more importantly, a prevailing theory regarding how the Earth took form involves asteroids, specifically that they were responsible for depositing water and minerals on the planet as it was cooling some two or three billion years ago. YU55’s close, though fleeting, proximity will give professional researchers the opportunity to collect telemetric data that will allow for scientists to test this theory. It also lets astronomers take a close look at the class “C” of asteroids, which are very common but not very well understood. No doubt the upcoming astronomical event could help us rectify that problem. That term deserves a bit of explanation. Layman and scientist alike clamor for finding a planet that can support life as we know it. But to do that requires particular conditions that were not discovered outside of our solar system until recently. Basically, the “habitable zone” is the distance range from a given star in which a planet can orbit and be able to support life. Too close to the star outside of this zone, and any water — aside from a Nitrogen-Oxygen mix atmosphere, is pretty much the Nummer Eins requirement for complex organisms to survive — will boil away (read: Venus). Too far away from the star, and water will perpetually freeze (Mars being a borderline case in that regard). What scientist have just discovered are some planets within the zone — not too cold, not too hot, but just right. 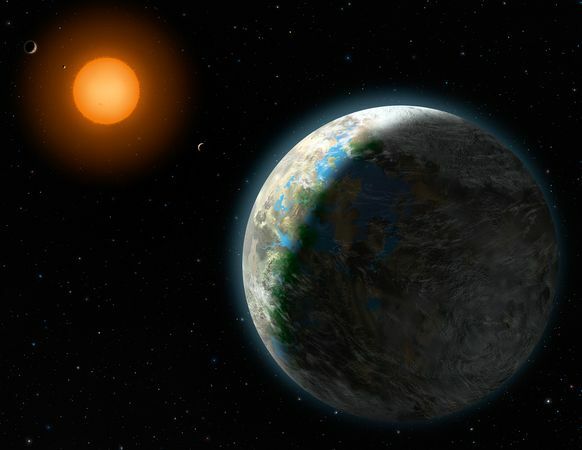 Another such planet inhabiting its own “Goldilocks zone” is a world dubbed Gliese 581d, though it orbits a red dwarf star, and as such, its habitable zone is much closer to its respective star than Earth’s orbit is to our Sun. On the other hand, should the system in which the binary Rigel star (a.k.a., Orion’s left foot) have such a zone, it would be much further away. The reasons could hardly be more obvious. In addition to being many times the size of our Sun, it also burns much hotter: it’s temperature is about 11,000 Kelvin, in contrast to the Sun’s comparatively milder 5,778 K emanating from its photosphere. Translation: Rigel’s habitable zone, should it even have one, would be a heckuva lot further away from that star than Earth 93 million-mile distance from Sol. Seeing things in a larger context, it is remarkable how many gas giants have been discovered outside of our solar system, but how very few smaller rock planets we have found. As Earthlings, it is only natural to see things within the purview of our own star’s system, and as such, we are quite apt to see Jupiter, Neptune, and Saturn as exceptional worlds. But given the extrasolar gas giant-to-rock planet discovery ratio as of late, these recent developments should serve as a reminder how truly exceptional this third rock from the Sun is. Much more information on this remarkable finds are offered in great, engaging detail on this National Geographic web pages. Read on! And things like Third Dimensions. Apparently, not anymore. Albert Einstein’s famous Theory of Relativity, introduced to the world in 1905, caused us to rethink lots of things about physics. Part of the contention within that theory is that nothing can go faster than the speed of light, or 186,282 miles per second. Oh, and it was within that theory that Einstein gave us the famous equation E = mc(squared), or, Energy equals mass times the speed of light, squared. Just thinking about that alone could make one a trifle weary, as Herman Hupfield so eloquently penned 80 years ago. All that has been turned on its proverbial head with a very recent announcement that scientists at CERN, or the European Organization for Nuclear Research (actually, it stands for “Conseil Européen pour la Recherche Nucléaire,” in case you’re keeping score at home), clocked neutrinos — odd slivers of an atom — travelling a distance of 450 miles in a time 60 nanoseconds faster than light travelling that same span. Needless to say, this announcement has turned more than a few heads in the scientific community, and has invited almost an many skeptics. One thing that has invited scrutiny is the very nature of neutrinos themselves. As sub-atomic particles, not everything is understood about them. They have been baffling scientists for 80 years (read between those lines, and it’s downright amazing that scientists even knew about neutrinos in the early 1930s). They are nearly mass-less, and the dear reader would be well-served to keep in mind that atoms themselves are mostly empty space. Phillip Schewe, communications director at the Joint Quantum Institute in Maryland, offered some perspective on these enigmatic particles, saying that the neutrino has almost no mass, comes in three different “flavors,” may have its own antiparticle and has been seen shifting from one flavor to another while shooting out from our sun. To complicate things further, to say nothing about the validity of these potentially ground-shifting findings, is that different levels of energy, according to some schools of thought, can affect the speed at which neutrinos can travel. Naturally, just mentioning the term “neutrino” can cause the average reader to blink more than once, so to help create understanding about the context of these potentially game-changing scientific measurements, one can resort to Howstuffworks.com to give a rather brief explanation about neutrinos that the non-scientifically inclined can understand. Another explanation on neutrinos on the same website can be found here. The reason I keep labeling these as “findings” and not an outright discovery is because the very scientists who took the readings are reticent to use that term. Like good, objectively-minded scientists, they actually invite the scrutiny, inviting other scientists to independently verify the data before using the vaunted ‘d’ word. Scientists at the competing Fermilab in Chicago already have announced their intention to run tests to see if the readings can be duplicated. So have the rules of the game of physics changed? Chances are, there are about to. But seeing things in a broader context, if the idea that nothing can exceed light speed as “settled science” is on the verge of being invalidated, what else could be rendered out of date as a theory in the years to come? Former Vice President Algore has been — very un-scientifically — claiming that “global warming” has been “settled science” practically since he left the Blair House. What’s more, he has denounced anybody who denies that which he claims as tantamount to racists. Seriously. Yet the overall lesson to be learned is, if even Mr. Einstein’s theory is no longer settled science, theoretically, nothing could be. After all, as I myself noted in another recent post, nothing is static, as the science of physics has taught us time and again. And that is fine. Unbiased science requires constant questioning, not necessarily of obvious, plain-as-day fundamentals (why waste the mental energy and everyone’s time? ), but certain long-standing theories could always stand some questioning. If the theories are sufficiently valid, they shall always stand up to scrutiny. If not, they shall go the way of phrenology and alchemy. Plus, on an even brighter note, we could be that much closer to discovering the hidden key to warp speed! As an aside, the opening poetic stanza is from the ever-famous, ever-timeless song “As Time Goes By,” written by Herman Hupfield in 1931. Rudy Vallee recorded a version of that standard that same year, and to me, it remains one of the best of the countless versions rendered by countless artists over the past eight decades. The only other version that stands above the rest is Dooley Wilson’s famous rendition from “Casablanca” in 1942. That said, Billie Holiday’s 1944 version is not too shabby, either.